AFCA Forums > Antique Fan Collectors Association > Post-1950 (Vintage) > Should I pick this fan up? 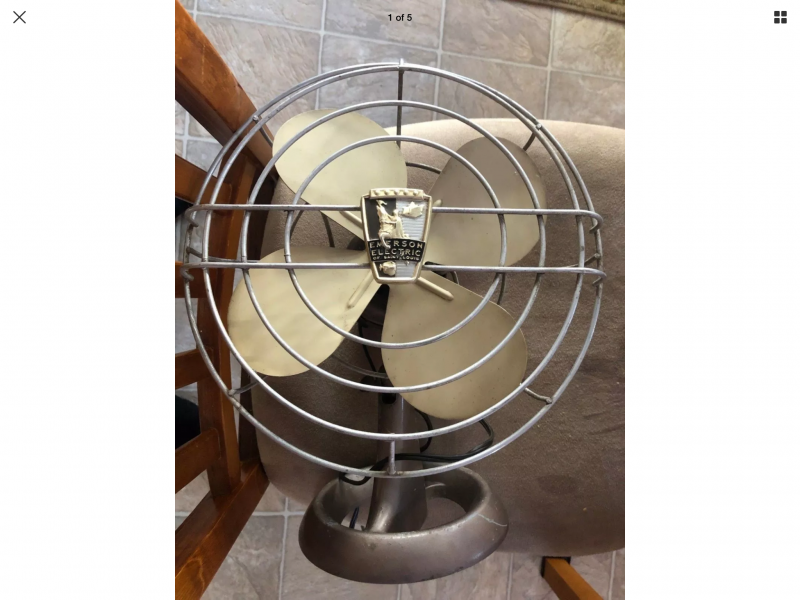 A person I know has this fan for free but lives 50 miles round trip, with this description: 2-speed vintage metal table fan that works great, except that the oscillation feature no longer works. Also, it has a replacement power cord. Would it be worth the trip to pick it up, I don't know the fan model/maker and only have this picture attached here. To me if it was 10 blocks away I would not go get it. Hard to see in the pic but it looks like a dime store fan and if it doesn't oscillate that's even worse. I think you can find better closer to you. Thanks Don for taking the time to offer your advice, that was my thinking too but a part of me would like to save every vintage fan. I just hope to pass on my small fan collection to the next generation to enjoy. I have a small 10" Westinghouse brass blade fan that brings me so much joy looking at it multiple times a day and hope to give that thrill to someone else that appreciates them. It's hard to tell for sure from the picture but it looks like a 12" Handybreeze to me. The oscillator may be repairable but even then its value would be about $50 max. Your call. Leave it be. Those tin fans are a dime a dozen and you can pick them up for almost nothing at Fan Fair, if they are even there. But if you think it’s junk then I would not go and get it I wouldn't say "Junk" I just wouldn't drive that far for that kind of fan. It doesn't look like any Wagner fan I've ever seen and I have four of them. Handybreeze or similar is still my guess. Mark, you might have to go get it just to settle this. Its a Handybreeze. They have 3 chrome "rails" from the rear of the bullet to the cage. I dont think you could get more than $20 for it, but if you like it go for it. Free is free. Its also missing the badge on the front of the blade. It would have been red. It's a little Emerson junior and a later one at that. Not too valuable, not a terrible fan, and definitely not the best Emerson made. Nothing Emerson about that fan. But I see the straight lines in the cage. Page processed in 0.1802 seconds (19% database + 81% PHP). 30 queries executed.